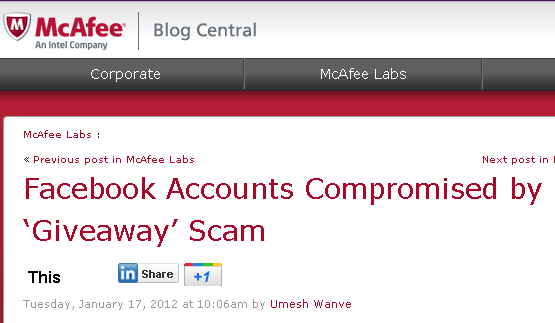 A recent social engineering attack that targeted Facebook accounts hit very close to home. One of my friends mentioned to me that his account was no longer accessible and that his password was not working. He even found his primary email address changed to another email. So I went onto Facebook to see his wall posts and I found scam messages offering a free giveaway. The scam automatically post this status on the wall to convince other friends to click on that link and get the “free” recharge. The post has a clear-text website address that points to the malicious website. Once users click on that link, they will be taken to the website, which asks for their Facebook account details. Victims are required to complete the surveys to get the recharge coupons, which do not exist. The attacker’s motive is simply to steal real Facebook credentials and to earn money with the help of the surveys. We have learned from a few victims that their accounts were totally compromised after falling prey to this scam. The attacker not only changed their account passwords but also deleted their primary information such as email addresses. Even if the victims try to reset their passwords, they will never get the password reset email from Facebook. Be careful when responding to lures and “offers” such as these. If a deal sounds too good to be true, it most likely is.